Previzion’s built-in keyer uses a real time implementation of dvMatte Pro 3, an extremely fast and powerful GPU-powered visual effects keyer. dvMatte Pro works with a combination of keying technologies, including a special detail extraction system that is capable of extracting single hairs from the background. Previzion incorporates parameters found in dvMatte Pro 3 as well as some customized adjustments optimized for Previzion’s real-time keyer. The keying interface is comprised of drop down menus, color pickers, sliders and input boxes. Should you need to go back to the original settings, you may quickly do so with the Reset button. 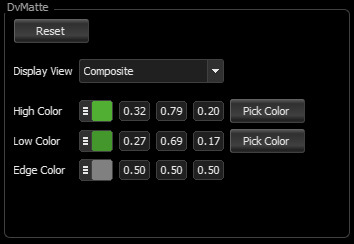 This will restore all values in the Keying Tab back to their default “green screen” values. Even with Blue Screen this is almost always a good starting point. Foreground: shows the unchanged incoming live action footage. Unspilled: show Foreground with despilled image. 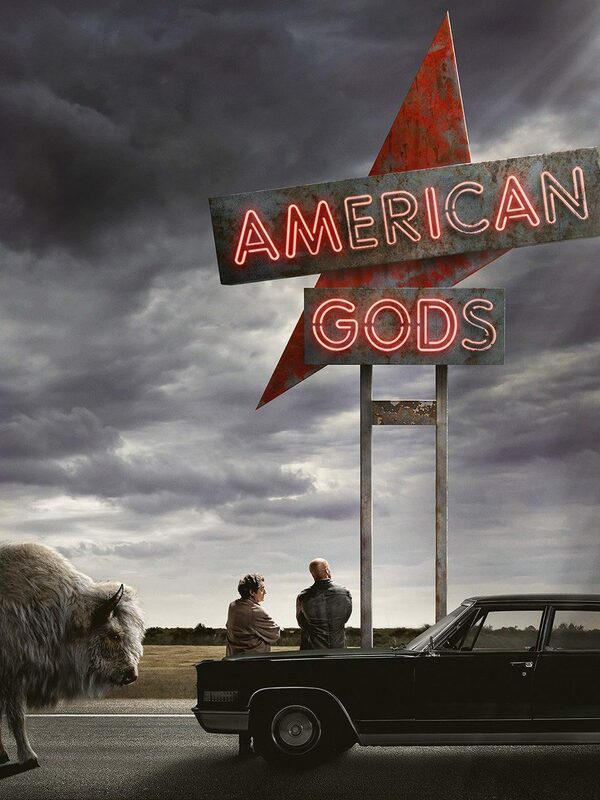 Matte: shows the current matte. Blend: shows the detail extraction image, that will be used to extract fine details. Scene Blend: shows the background image with a rough composite of the foreground image, using only the details that will be added during the blend operation. Depth: shows a “near-versus-far” display of gradients to represent the virtual depth. Composite: shows final composite view. Most compositing operations will be done in the default Composite view, where the final effects of adjustments can be most clearly seen. To set your green/blue screen key, start by picking out your High Color and Low Color using the color picker and clicking on the live incoming video. To select the High Color, click the **Pick High Color** button. The point of the cursor is used to sample colors, the view displays the incoming live video, and a real time display of the RGB values of the pixel that is underneath the cursor (normalized to 0-1 values) is shown in the **Cursor Color** box. Click on the brightest area of the green screen, avoiding highlights that are not a part of the overall tone of the screen. To select the Low Color, click the **Pick Low Color** button. As above, the point of the cursor is used to sample color, and the RGB values are displayed. Select the darkest area of the green screen, avoiding overt shadows cast by the foreground subject or other set elements. When your mouse over the live video to pick your color, Previzion averages the values of the pixels that the pointer is dragged over while the mouse button is pressed down. This way, the user can avoid being spoofed by local noise. 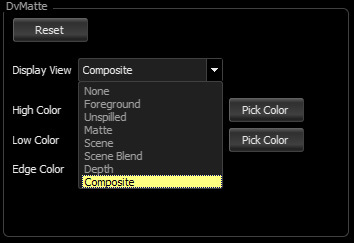 The other matte settings, chroma, supression and mix adjustments are covered in more depth on the following section. But when an evenly lit green/glue screen is set with the High Color and Low Color setup, almost all the following adjustments should only require minimal tweaking. If the matte has dark or white edges, you can modify the foreground and background matte edge curves with this function to remove the dark or white edge. This is most useful when making the outline color match your background. Always try to set this last, meaning, after the key color has been picked, base matte’s white/black points set and so on. These controls control the foreground and background matte of a traditional Add Mix composite, as described in Wright’s book. The default settings, with gamma=1, provide a standard linear matte function. The adjustments here should be very subtle. Base Black Point: As you raise the black point, gray values below the threshold are pushed toward black. Use this setting to push darker portions of your matte towards pure black. Base White Point: As you lower the white point, gray values above the threshold are pushed towards white. Use this setting to close dark “holes” in your matte towards white. To produce smooth production quality mattes, Previzion’s built-in keyer uses a 2-color difference keyer and a color difference matte. While the effects of these settings are visible with the general view set to Composite, you’ll usually want to have the view set to Matte when manipulating these settings. There are three main color difference method options. When first trying a shot, you’ll want to cycle through the methods to see which is going to give the best results for the clip in question. Average of 2nd and 3rd channels (default): a combination of the second and third channels are subtracted from the first channel to in order to create the base matte. This works the best for about 90% of green screen shots. Max of 2nd and 3rd channels: a maximum operation is performed on the 2nd and 3rd channels. The result of the max operation is then subtracted from the first channel to create the base matte. Min of 2nd and 3rd channels: a minimum operation is performed on the 2nd and 3rd channels. The result of the minimum operation is then subtracted from the first channel to create the base matte. Settings in this section are used to adjust the blending of the foreground and background images during the final composite. Blend Amount: Adjusts the amount of preserved foreground detail that is brought into the final composite. Blend Highlights: Brightens or suppresses highlights in the blended detail. Blend Saturation: Adjusts the color saturation of the blend details. Blend Brightness: Adjusts the pre-composite brightness of the background image. Channel Mix: This controls the mix between the 2nd and 3rd channels in the Average setting above. By default, the Channel Mix is set to 0.5, which is a 50% average between the two channels. By sliding towards one side or the other, the mix can be set. In practice, 0.5 works the best for most shots. With red, frizzy hair, pushing the average to 0.6 will get rid of green fringes. Dynamic Spill Suppression: Adjusts the amount of dynamic spill suppression to apply to the foreground. The removal is ”dynamic” in the sense that it takes into account the brightness of the background at each pixel in order to determine the appropriate brightness of the unspilled pixels at the edges of the foreground. Edge Color: dvMatte automatically applies a despill operation, which removes the blue or green light spill that is frequently found on the edges of a foreground subject. The despill operation can leave edges of a grayish color, which needs to be matched to the background to avoid an obvious edge. Click the Pick Edge Color to select an edge color that matches the background. Detail High Point: Manipulates the high point of the detail matte before it is blended with the base matte. Lower the high point from its default to push gray values towards white in the detail portions of the matte. Detail Low Point: Manipulates the low point of the detail matte before it is blended with the base matte. Raise the low point from its default to push gray values towards white in the detail portions of the matte. Detail Gain: Can be used to raise or lower the brightness of the detail matte before blending operations are applied. Settings in this section are used to apply blur and translation operations on the color channels of the foreground material, in order to offset artifacts due to color subsampling. Horizontal and Vertical Blur: Apply a horizontal and/or vertical blur to the color channels of the foreground in order to soften the blockiness that can occur during compression. Horizontal and Vertical Shift: Apply a horizontal and/or vertical translation to the color channels in order to offset slight pixel shifting that can occur during compression. Scale: Scales the overall background matte. Light Wrap simulates the effects of light wrap in which light from the background image is seen wrapping around and brightening the edge of a foreground element. While generally a very subtle effect, it can provide the extra bit of realism that “sells” a composite and makes your composited foreground image sit well in its background. Wrap Composite – Provides three options for computing the wrap effect. Choose the option that provides the best effect for your foreground / background combination. Wrap Amount – Controls the overall intensity of the wrap effect. Wrap Blur – Adjusts the radius of the light-wrap effect around the edge of the foreground element.